Our 20 Meals from Costco for $150 was quite popular as so many people found it helpful – yay! So, we decided to do the same menu plan (with a few substitutions) for those that shop at Sam’s Club. Yes, I realize this makes for more like $7.50 dinners. You’ll have lots leftover! I would expect you to have some ingredients needed for the different recipes in your pantry, like spices, soy sauce, etc. In the recipe/ingredient list and printable below, I’ve only included the ingredients from the Sam’s Club purchase list. Let’s get to the recipes and printables, shall we?!? A couple of recipes call for bell peppers…they are optional, and would add another $5-$7 to the total. Leftovers – you will have lots leftover too…including a jar of spaghetti sauce, lots of rice, jar of salsa, several pounds of potatoes, a ton of Parmesan cheese, a load of beans and smaller quantities of other ingredients. I did not reflect these “leftovers” in the total cost, so it would really be $10-$15 less than $150!!! Also, please note that the recipes call for cooked beans…here is more information on how to cook dried beans since Sam’s Club doesn’t sell canned beans. It’s not hard – you can do it! Also, due to having a large amount of inexpensive leftover rice and beans, feel free to pull some recipes from our Rice & Beans Budget post to help you use up those ingredients in a frugal way! Make it Simple…get the recipes and shopping list printables for just $4!!! I have a Sam’s membership and I’m really excited to try this! Can anyone confirm that Sam’s in the northeast US sells dried beans? I couldn’t get any info from my local store! found it online! They do carry the pintos. They do sell them here in Savannah/Pooler Sam’s club!!!!!! Some of these wouldn’t have enough food for my family but I can double them and its still cheap! Thanks! I did the Costco plan, and thank you – the recipes were great! I’m tempted to grab that Groupon for Sam’s! That’s a great deal! We have a Sam’s membership, and we do buy canned beans there. They sell a box of 6 cans of the Bush’s brand pinto beans at our local Sam’s. The link for the Rice with corn and pinto beans recipe takes you to a quinoa recipe with lime and cilantro. Is that link correct?? This link does not take you to the correct recipe. What is the Rice with Corn and Pinto Beans recipe that goes with this shopping list? Or does this shopping list have to be reworked for the Quinoa recipe? More like 15 meals for me. Was thinking about purchasing a membership to costco so I could follow your previous guide, but this is even better! Sam’s does have canned beans, bushes brand pinto beans in a 6 pack. Don’t bother with the frozen chicken breasts at Sam’s, they’re tough and mostly water (both the Tyson and the Daily Chef varieties), and generally inedible (especially when reheated). If your local Aldi has them, you can usually find 6-lb packs of chicken breasts on sale for about $1.50/lb, and they come out moist and juicy. I buy chicken breast at sams all the time and they taste just like the ones from the grocery store. Thanks for this! Can’t wait to check out your whole blog. I printed the shopping lists as soon as I saw this article and went to the store. I was so excited to try this! While the lists are great STARTING POINTS, they are not all-inclusive to what you’ll need for all of these recipes. You will definitely want to click on every single recipe and print each one separately so you have all of the necessary ingredients and instructions BEFORE you go to the store! I wish I had taken the time to read each recipe and add the additional ingredients that are NOT included on the master list (or the Recipe and Ingredients List). I was expecting to have purchased everything I’d need so that I could come home and prep, then freeze all of these meals. I’m half-way through but can’t finish because I need to go back to the store. Having said that, this is a GREAT idea and I’m glad someone took the time to put it together. Clarification: I don’t want it to sound like this list and recipes are not completely amazing or that I wasn’t happy with what $5 dinners put together. If anything, I was upset with MYSELF for not reading all of the recipes in detail (which was NO fault of anyone else! Everything was organized and available, I was just overzealous and wish I’d planned a bit more before heading to the store). That is all 🙂 Thanks again! I just wanted to say, I have now shopped this list two months in a row, and have been really happy with the results. I HAVE had to increase the amounts in the recipes, but I have two teenaged boys, and one pre-teen boy, so that makes a large difference. Still, this has been very affordable for us, and my whole family has enjoyed the recipes. We also like that this still leaves room for me to work in some of our favourite meals, while still sticking to a budget. I was wondering, though, will you be doing another plan like this for Sam’s Club, as I noticed you are doing a new one for Costco? I greatly hope so! Thank you for doing all this work, it is certainly benefitting my family! Went to Sams Club bought the items off the list. Two meals into the list and I Loved them both. Please do a second list for Sams. I paid for the first list and will gladly pay for a second list. I’m not seeing 20 meals here. What am I doing wrong? Thanks. I didn’t want to be left out if there were more. Will you be making updates anymore? I am concerned about the items going bad before we can eat them. Is this something that happens? Especially the meat, or is that why you have to freeze them? And what about the rolls…am I supposed to freeze them? This may be a silly question, but for the freezer meals do I need to cook the meat before I put everything in the bags?? Like for the beef and broccoli stir fry… Do I really just dump all of the ingredients in a freezer bag? Is the Sam’s club, meal plan #1 still available? How many do most of these meals feed?? We have 8 of us to eat every night. I assume most recipes are for 4?? I still could do the ones that say 2 and made a full meal still better than what I am spending now! Meals are based on 4 servings each. Was really anxious to save money and time by using this shopping list and recipes. But I’m already frustrated that the list doesn’t include everything in the recipes. For example, the Beef/Broccoli stir fry. A major ingredient, Flank Steak, is not on the Grocery List. I didn’t think i had to review every recipe for accuracy. For a newbie, it’s disappointing. Hopefully the end result will still be good. Thanks. Kimberly – so sorry for your frustration. If you notice on the recipes included in the printable pack, we changed the flank steak in the Beef & Broccoli Stir Fry to chuck roast because that’s what Sam’s Club sells and the kind of meat we used in the ingredients list for this particular meal plan. Hope that helps! 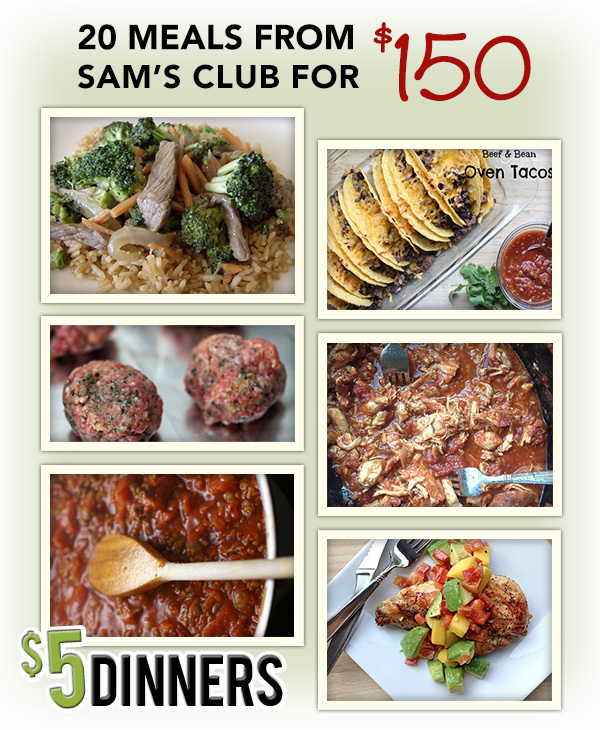 Oh, I really hope that you will have more of these 20 meal lists from Sams!! What is the best way to go about cooking these in to make the most of any perishable foods? i dont have a costco close by….is there a gluten free sams club list? I am really looking forward to trying this! For a couple of years now, I have used Sam’s FREE “Click n Pull” service: you order online at your leisure, and they fill your cart(s) for you. All you have to do is show up at the day and time you selected and your shopping is done for you. I love having a plan to streamline it all; looks like stuff we eat anyway. Thanks!